Whatever airline you’re going to take and wherever you may go in the world, all airlines have restrictions when it comes to luggage—whether it be the actual size or its total weight. If you exceed these restrictions, then you will need to pay extra charges, which is why it is very important to learn how to weigh luggage. Every day, thousands of passengers pay extra for excess luggage. Some who don’t have the means are forced to leave some of their stuff behind just so they can cut the weight and continue on with their flight. In order for you to avoid these unwanted circumstances and long lines at the check-in counter, you need to check the weight of your luggage before you even go to the airport. Weighing your luggage before you go to the airport is a critical thing to do. This is so that you can make sure that you don’t exceed your luggage limit. Then again, how do you exactly measure your luggage? This is the traditional way of weighing luggage wherein you use the same type of weighing scale that you use to check your body’s weight. The trick is to check your body weight first, then carry your luggage and check your body weight again along with your bag. Now, you need to subtract both of the numbers, and the result will give you the estimated weight of your luggage. Most of the time, bathroom scales are not systematically accurate and may result in you still paying for your extra luggage. Experts suggest that you should always go down one pound on your luggage so that you can avoid exceeding the airline’s restrictions. This type of scale allows you to check the weight of your luggage while you’re carrying it. A lot of manufacturers have turned to produce digital handheld scales because of the fact that it is lightweight and can be carried around when traveling. These scales are mostly very easy to use. You just hook your bag on the scale, carry the handheld scale, and it will show you the number of the actual weight of your luggage. These products are usually accurate and handy at the same time. Nobody wants to pay for a few extra pounds on his or her luggage or be forced to rearrange the items on their suitcases in front of a lot of people. For this reason, it’s important to check the weight of your luggage even before you go to the airport. Knowing that your bag is under the weight limit of the airline will not only save your energy, but it can also save your precious time. If your bag is under the limit, you don’t need to scramble around trying to fit everything together while there are a lot of people who are waiting in line behind you. To know the exact weight of your luggage even before you arrive at the airport is important. It’s clear to a lot of travelers that some of the airline baggage scales are not accurate, which is the main reason why you need to know the weight of your luggage. If you’re stuck in this situation, remember that it’s all right to ask the staff nicely to reweigh your luggage or reset their scale. Checking your luggage weight before you go to the airport can reduce your travel stress because you don’t have to worry about going over your limit all the time. The peace of mind of not having to rearrange your things or paying extra money will allow you to relax and enjoy your journey every time you travel. Once you get to familiarize yourself with the right weight of your luggage, you get the chance to pack lighter materials with your travel. It’s important to know that not all clothes have the same density and weight, which is why a lot of experts suggest that you choose the clothes that are lighter and can cover a little amount of space. By not going over your weight limit, you get to avoid paying extra fees for your luggage. This means that you can spend those extra dollars to the ones that actually matter like more items to shop or more shots to drink. 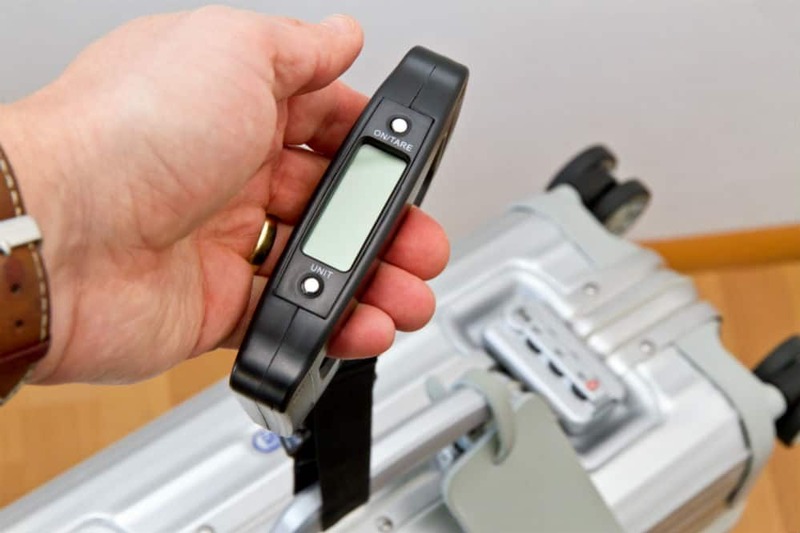 If you are already using a luggage scale, then you get to experience a peace of mind wherever you may travel. By bringing these little scales with you, you don’t get to worry about going over your limit when you buy your souvenirs. These scales often weigh less than 5 pounds too, which is why they are very easy and convenient to bring along. Buying souvenirs and ensuring that you’re within your weight limit can be a little troublesome. Yet, if you have your own luggage scale, you don’t need to worry about that at all. These scales will not only help you know the weight of your bag, but most of it has features that can convert pounds to kilograms and even measure temperature, which is essential for those delicate souvenirs. If you want to start your dreams of traveling the world or if you’re already doing it, it’s important to make checking the weight of your luggage a habit. Different airlines mean different restrictions on baggage weight limit. Airlines don’t only differ in weight limit restrictions, but they also differ when it comes to charging fees. Exceeding their required limit can make you pay around $50 to $70. This scenario can be a bit troublesome, especially for those who are on a strict budget plan or for backpackers. Lucky for you, now that you know how to weigh luggage, you can rest assured that you won’t need to pay a single centavo for these extra charges.